Reports claim LG plans to unveil a brand new Android smartphone next week, a mini version of its G6 flagship. Given that not much has transpired when it comes to information about specs, the listing of the handset on Geekbench gives us the opportunity to talk more about the so-called LG G6 mini. As some of you might be aware, the initial report about the LG G6 mini, or LG Q6, mentions the smartphone will sport a 5.4-inch display, 3GB RAM, and a 13-megapixel rear-facing camera. 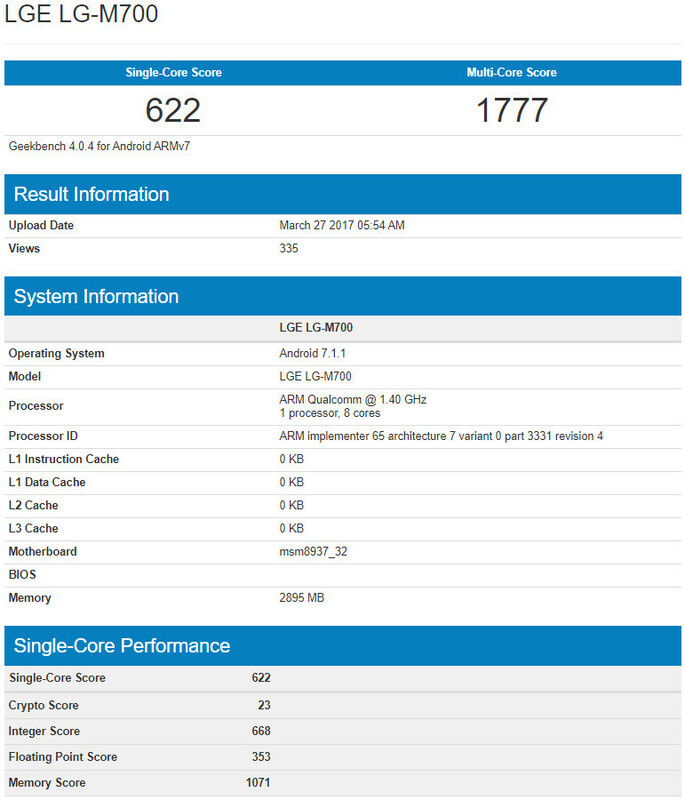 Thanks to the listing at Geekbench, we now know the smartphone will be equipped with a 1.4GHz octa-core Qualcomm Snapdragon 430 processor. Also, the LG Q6 is supposed to run Android 7.1.1 Nougat right out of the box. The smartphone is stored in benchmark's database with model number LG-M700, but it was listed back on March 27. Even so, there might not be too many differences between this prototype unit and the final version of the device. LG has been doing this since G2 mini, G3S, G4c. Yeah ... I was hoping it will be sd660 that was previously rumoured. Why the hell would they make an official announcement hyping of this if it's so crappy? 5.4 inches with 18:9 aspect ratio is tiny btw. If it was 16:9, then I agree 5.4 isn't mini but if you handle the G6, you will know what I mean. Snapdragon 652 would be more appropriate, IMO... That would have made the G6 mini a proper mini of the flagship. My Z1c still does better than this..come on LG, atleast an SD625 so we can call it even just "midrange". SD430 is a low-mid end SoC, and if this thing will only have the SD430, it should be priced just around $200-250. I don't understand the negative reaction in this Thread. Folks, you're not the target audience for this device, this is towards the Mid-Range/Entry-Level Market, LG has always done this with their past Mini Iterations, so why is it an issue now?? This phone is being hyped for the Mid-Range/Entry-Level Market, not those who want octo-cores in Smartphones. Where was all this whining back when Samsung released a Mini Version of the Galaxy S6 with the SD808 while the Galaxy S6 had the Exynos 7420 Octa-core processor?? insatiable. In which world did samsung release a S6 mini ? They released it on a Planet called Earth back in 2015 before eventually discontinuing the Model. Point is, if some of you are going to complain about LG making the specs lower for their Mid-Range/Entry-Level Devices (which makes sense), do the same crap when other Manufacturers do that to their Products. Don't 50 Percent your whining, go the extra mile to 100 Percent. https://www.androidpit.com/samsung-galaxy-s6-mini-officially-killed-off Here's a quote from the link "But these spin-offs never sold anywhere near as well as the flagship device and – in all honesty – kind of watered down the flagship brand name by not being as good." which should imply to you that this phone was on the Market whether it was a Month or so, or a year. Samsung killed it off and made the A Series their Midranger. So yes there was a Mini version of the S6 that Samsung killed off shortly after. There is no Link to find a Galaxy S6 ON SALE, because Samsung discontinued it, meaning prior to it's cancellation, it was available for a short period. oh, come on.... Samsung might have worked on an S6 mini, but it was never launched. so it was not on sale anywhere.not even for a short period. Samsungs last mini was S5 mini. I'm well aware that Samsung had a Mini version of the S5, back in 2015 I heard about the Galaxy S6 Mini, I now did further research and found out that the S6 Mini was an idea that never came to fruition. Misinformation on my behalf. And there it will get trounced by the superior Motorola phones which do have the better, more power efficient processors. Like really? None of you use facebook? LG has been advertising this phone with a 5.46 inches 1080P display and dual 13mp cameras. One handed usage has been mentioned and metal frame.